There will be a time when a person comes across a situation where he experiences some sort of anxiety issues. Especially when it comes to attending a job interview. Some people overcome such level of anxiety issues easily, but some people struggle with such situations. Therefore, during job interviews most of the candidates struggle with their anxiety issues and because of such level of anxiety, a person might lose his chances of getting that particular job. There are several ways to overcome job interview anxiety and some of them are very beneficial and effective when it comes to job interviews. And those effective methods and job interview tips for overcoming anxiety and calm nerves during job interviews are as follows. Sometimes it happens that people with job interviews panic a lot before their interview day and finally they mess up everything on the day of the interview. So it is always best for the person who is going through an anxiety issue because of the job interview, to visit the venue before the interview just to make himself comfortable around. Then on the day of the interview that candidate can focus more on getting that particular job. Some people have a habit of arriving at some places on time or later. But if a person has anxiety issues, then it is always better to arrive at the interview a bit earlier than expected time. And by this type of behavior that candidate might understand that arriving early on the interviewing venue helps the person be calm on the time of the interview. It also helped him to observe the rest of the necessary things which is relevant to ace his first impression on the interviewer. It is always advisable to all the candidates that after applying for the position in a company, that candidate should be aware of the interview process and try to gather as much as information about the company and the position offering from that company. Therefore, researching well in advance about the company and their offering position helps to acquire more knowledge about the interview, this eventually presents a positive side of the candidate’s interest towards the company. Most of the time people try to show their interest towards the company and the position offered. But they often forget about the people who are supposed to be focused on and they are the interviewing people. Therefore, every candidate must be aware of the interviewing panel so that they can impress them more than their answers. Once the interviewer gets impressed by the candidate, then nothing can stop him from getting that position in the company. It is very much necessary that while preparing oneself for the interview a common stuff that needs to be kept in mind is their professional presentation. And that is how they present themselves and they need to be clean while presenting themselves professionally. Therefore, every candidate needs to wear something clean and comfortable which should present their personality suitable for the position that the company is offering. Some people might experience some sort of anxiety with these job interviews. Therefore, to avoid such level of anxiety a person need to calm themselves first, then try to explain themselves that it is not a big deal that if they get the job in that company or not. The important thing which matters to a person is that at least they tried to attend an interview, even if they knew that they will fail in their attempt but because of their confidence in themselves they attempted this, so it needs to be appreciated instead of feeling anxiety. This can help a person to be calm during the interview process. Most of the people feel an extreme level of anxiety before their interview, if the interview matters to their career the most. But being nervous or feeling anxious can make things worse for the candidate. Therefore, to make oneself comfortable during the interview the candidate need to exercise or take a walk in the morning to clear his head on the interview day. It is necessary to have a complete healthy and rich breakfast every day, but some people have a habit of skipping their first meal of the day when in rush or something comes up in urgent. Therefore, if a person have an interview one morning and because of anxiety if he does not feel hungry that day, then he should keep in mind that if he skips his breakfast, then there is a possibility that the person can feel hungry or lose control during the interview. It is possible that some people might experience anxiety during their interview, but asking questions after the interview session makes the candidate be more suitable for the post that the company is offering. Therefore, it always favors the candidate better if they keep themselves ready with some questions for the interviewer regarding the company and their position with benefits. And finally, preparing the questions can even help the candidate to be confident. There is a possibility that because of nerves and anxiety a candidate might blow up his chances of getting that job. Therefore, to avoid such situations a person need to practice their interview sessions at home, which can help them be better during the interview. And to make that happen a person need to conduct a fake interview at home where he need to be fully prepared with all possible questions from the interviewer and then this can lead the candidate feel confident enough to answer any question during the interview session. Some people might not feel so comfortable while talking about their weakness in front of others, but during the interview if an interviewer presents such questions which involves one’s weakness, then it is the candidate’s responsibility and maturity to handle that situation cleverly without losing his chances of getting that job. Therefore, every candidate needs to practice talking more about their weakness with the help of those fake interview sessions at home. Sometimes it is hard for people to overcome their anxiety issues as compared to the rest of the people. But it is always better to try something instead of quitting. Therefore, every candidate needs to stay confident and positive during his interview session even if the questions presented by the interviewer make one feel negative. For example, while talking about the previous job experience a person need to keep in mind that his negative reaction over the question can make things tough during the interview. Some candidates might start feeling irritated during such long and frustrating interview sessions/waiting sessions. But some candidates are put through such pressure to check their patience level with the rest of the interview sessions. There is even a possibility that during such late interview sessions most of the candidates might lose their interest over the interviewer and at that time the interviewer can figure out about one’s seriousness regarding this position. There is a possibility that the candidate might start losing his focus from getting the job because of his anxiety issues. But to overcome that situation a person need to start taking deep breaths after and during the job interview. Therefore, taking deep breaths during and after or before the interview, helps the candidate to be more focused about the interview and not about the rest of the elements around the interviewing venue. People feel anxious before the interview because they feel that they might fail during such interview sessions. But instead of thinking more about failing the interview a person need to focus more on positive stuff about the interview. Therefore, a person need to keep in mind that it is some sort of communication building sessions instead of any interview sessions. So, it is better to stay positive during the interview and taking the interview as a conversing session to build better communication. Some people fear answering late during the interview might cost them a big time, but taking some time before answering any question can help the candidate be more sure of their answers during the interview. Therefore, it is always advisable to all the candidates that instead of making few job interview mistakes while answering the question in a hurry or messing up things, it is better to take one’s own time to answer the question so that there won’t be any chances of ruining things for their own self. It is always better to keep your reference details handy because that can help the candidate and interviewer waste less time over such official formalities. Therefore, it is better to keep all the necessary documents ready in advance instead of taking much time for further processing. And once all the necessary formalities are taken care of then there won’t be any issue with such official obligations when it comes to the candidate and the company. Sometimes it happens that the time and the venue doesn’t favor the candidate nor the interviewer at any point of time. And at that time the candidate and the interviewer might start feeling uncomfortable. Therefore, to avoid such situation a person might carry an extra resume or business card for the sake of scheduling another meeting with the interviewer. Sometimes because of some emergencies the meeting can be cancelled in the middle and the interviewer might ask for his business card to contact them for further discussion. There is a possibility that the candidate might run late because of some personal emergency and at that time the candidate need to be responsible and contact the employer about the delay, then decide whether to continue the interview or not. And the same can happen with the interviewer, because of some personal issues if the interviewer is running late, then it is his responsibility to inform the candidates before the interview instead of keeping them in wait. Some people plan some meeting after the interview without knowing the duration of the interview. Sometimes it happens that the interview sessions might take a longer time than expected and the thing which has been scheduled already after interview might have to wait for a long time. Therefore, it is better not to keep any plans after the interview unless it is not urgent. Instead of making someone wait or cutting the interview short, it is better not to plan any meeting after the interview. In short the bottom line is that feeling anxious during or before the interview is a common thing, but letting that anxious feeling all over a person and sabotaging the interview can make things worse for the future. 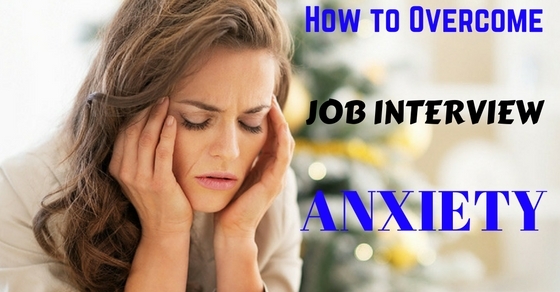 Therefore, in this discussion about how to overcome job interview anxiety, there is a list of stuff which can help all the candidates with their anxiety issues to overcome their anxiety by following these things in mind while planning or attending an interview.